However, this code only returns true when run in an elevated context, so it is not really a test of whether the user has local administrator privilege, but whether the code is running in an elevated context. The reason for this is that since Windows Vista and the introduction of User Account Control (UAC), an account that is a member of the local administrator group will get a split user access token. For most tasks, the account will use a filtered access token, which has the same rights as a standard user token. When a task is performed that requires elevation of privilege, the full access token will be used instead. Hence we get different results from the above command depending on which access token is being used. $administratorsAccount = Get-WmiObject Win32_Group -filter "LocalAccount=True AND SID='S-1-5-32-544'"
$administratorQuery = "GroupComponent = `"Win32_Group.Domain='" + $administratorsAccount.Domain + "',NAME='" + $administratorsAccount.Name + "'`""
The problem with both of these methods is that they wont work with nested groups. So if a user is a member of a group that is a member of the local administrators group, rather than a direct member, I can’t use these methods. It can be done, however. If we go back to our original code we can see that we are creating a Windows Identity object for the current user. This object has a Claims property, that lists the rights that the user has, mostly in the form of local or domain users or groups. In the Value property of Claims, we can see the SIDs of those users and groups. This will include nested groups, because even though the user may not be a direct member of the group, they still have the rights of that group. You’ll notice that the “BUILTIN\Administrators” group is listed in the Claims. This is the local Administrators group. Since the SID for this group is the same on all systems, we can search the Claims of the User Identity for this SID, and thereby determine if he or she is a member of the local Administrators group, either directly or indirectly. This will return True or False based on whether the Identity has the claim of that group. 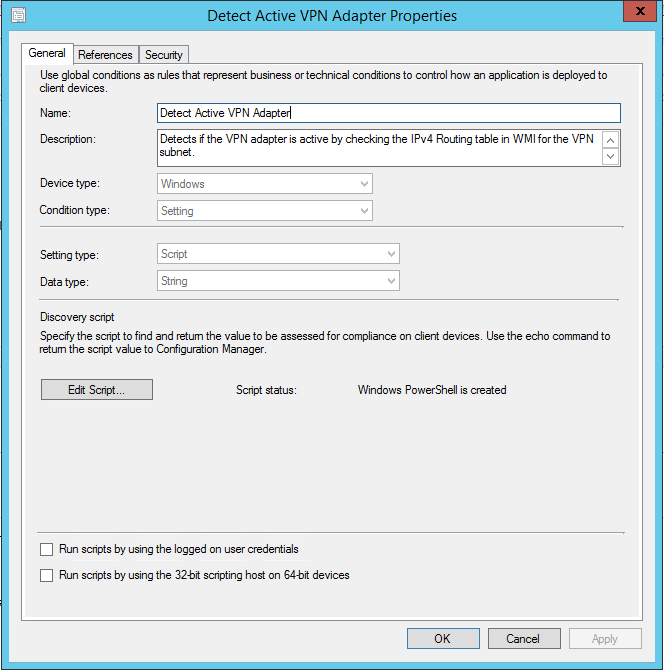 "You don't got the power :("
A common requirement with ConfigMgr deployments is to exclude clients that are connected to the corporate network via a VPN, when the total size of the content files for the deployment are too much to be throwing down a slow network link. There is more than one way to do this, but I have seen that not all are reliable and do not work in every case or for every VPN adapter out there. 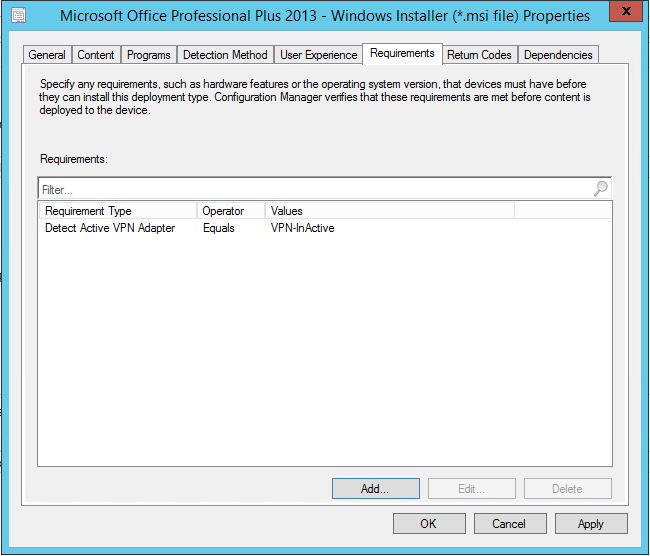 Get-WmiObject -Query "Select * from Win32_NetworkAdapter where Name like '%VPN%' and NetEnabled='True'"
Get-WmiObject -Query "Select * from Win32_NetworkAdapterConfiguration where Description like '%VPN%' and IPEnabled='True'"
The only concession is if your VPN subnets ever change, you will need to update them in ConfigMgr. In an Active Directory environment, probably the most reliable way to query the last logon time of a computer is to use the Last-Logon attribute. The Last-Logon-Timestamp attribute could be used, but this will not likely be up-to-date due to the replication lag. If you are using PowerShell, the LastLogonDate attribute can also be used, however this is also a replicated attribute which suffers from the same delay and potential inaccuracy. The Last-Logon attribute is not replicated, however, it is only stored on the DC that the computer authenticated against. 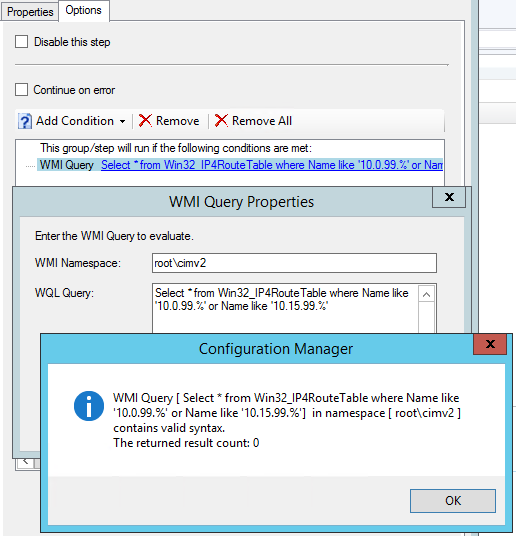 If you have multiple domain controllers, you will get multiple values for this attribute depending on which DC the computer has authenticated with and when. To find the Last-Logon date from the DC that the computer has most recently authenticated with, you need to query all domain controllers for this attribute, then select the most recent. Following is a PowerShell script I wrote that will read a list of domain controllers from an Active Directory OU, query each one, then return the most recent Last-Logon value. It uses parallel processing to return the result more quickly than processing each DC in turn, which is useful in a multi-DC environment. To use the script, simply pass the computer name and optionally the AD OU containing your domain controllers, to the function. You can hard-code the ‘DomainControllersOU’ parameter in the script if you prefer, so you don’t need to call it. You need the Active Directory module installed to use this. Get-ADLastLogon -ComputerName PC001 -DomainControllersOU "OU=Domain Controllers,DC=contoso,DC=com"